BijlmAIR resident Charl Landvreugd presents on Monday evening 13 December his new work Atlantic Transformerz 2010 which he made during his residency period from September to December 2010. In a lecture he will also discuss its context. BijlmAIR is an artist-in-residence programme run by Centrum Beeldende Kunst Zuidoost (CBK Zuidoost), Stedelijk Museum Bureau Amsterdam and Stichting Flat. Door open: 19.30h, start: 20.00h. Free admission. Landvreugd is a Dutch artist, born in Suriname and raised in Rotterdam. Aesthetically, politically, theoretically as well as practically, black is the base colour in his practice. The artist has studied at the Goldsmiths College (London) and Columbia University (NYC), and now continues his investigations of black and Blackness. 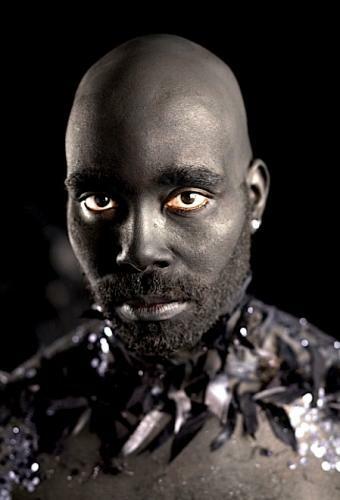 He explores the plurality of black hues and advocates for distinctions in black diversity. Inspired by the gathering of people from the African diaspora in the Bijlmer, he unites the four continents around the Atlantic in the video work Atlantic Transformerz 2010. In his presentation Landvreugd makes connections with the legacy of the Continental Black European thinkers Frantz fanon and Edgar Cairo. He is inspired by the concept Ujamaa (extended family), Sun Ra, The Transformers, Star Wars, the 90’s club-scene, Bruce Weber’s portrayal of the male body, and the music videos by Hype Williams. These Afro-Futuristic and postcolonial elements constitute the context of his work.